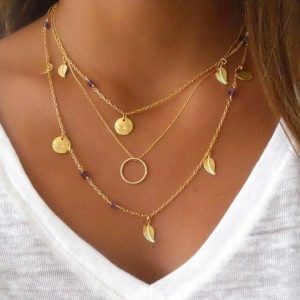 The layered necklaces of Aphrodite are very HOT! 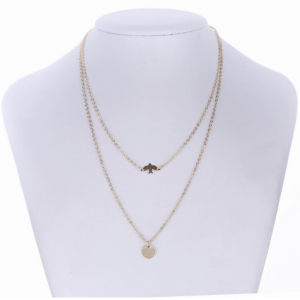 The double necklace is available in the colors silver and gold with 2, 3, 4 and multiple layers. With nice pendants such as, heart, star, moon and world map. Give your outfit a boost with these beauties! 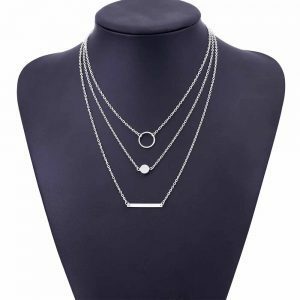 This minimalist jewelry set consists of a beautiful layered necklace and layered bracelet. There are blue beads on the first layer and a bar on the second layer. You can wear the necklace and bracelet with the others. 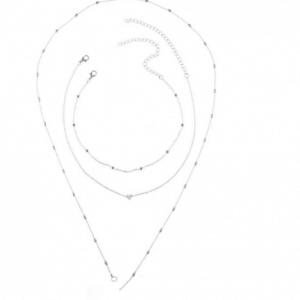 With a minimalist ring of stud earrings for free. The subtle design makes it easy to combine with your daily outfit. Do you have questions about the jewelry set with blue beads? Feel free to send us a message. Boho lovers pay attention! ???? 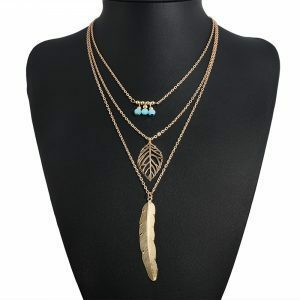 this layered necklace is for the free spirited boho-chicks who want to turn their outfit into something magical! It is a must-have accessory, that should not be missed in your jewelry collection! 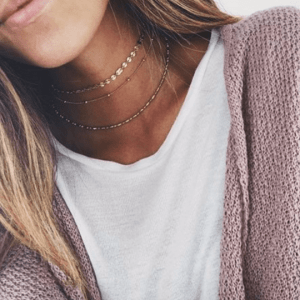 Necklaces in layers are not only super fun, but also very practical. You do not have to look for different necklaces for a layered effect. This bohemian necklace has four layers. There is a different pendant on each layer. A must have jewel for the boho lovers. This fun necklace is a suitable piece of jewelry for a festival, but also when your outfit needs that extra boost. Combine this cute double necklace with other boho vibe jewelry , such as statement rings with turquoise colored stones or small stud earrings. Wear it with your favorite boho outfit or turn your most basic outfit into a boho look. The perfect necklace for the boho-chicks, the dreamers, positive thinkers and the travelers. 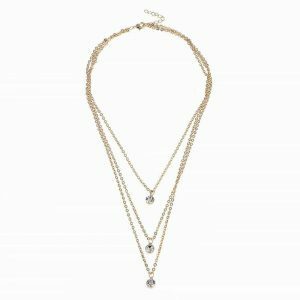 Do you have questions about the bohemian layered necklace ? Send us a message. 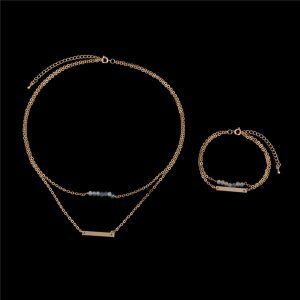 Steel the show with this choker set! With a beautiful piece of jewelry, the most basic outfit is transformed into something magical. 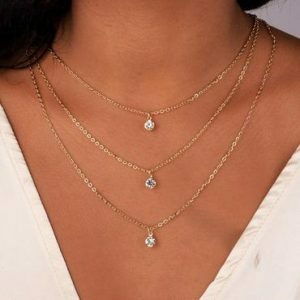 This choker set consists of three different chain chokers. Wear the chokers separately or even more fun, wear all 3 chokers together. Do you want to create a layer effect? then wear a subtle necklace with or without a pendant with your choker (s). Finish your look with a nice bracelet, ring or earrings with small coins. You can easily wear this beauty to your school / work or when you go out to have fun. ???? Tip ???? 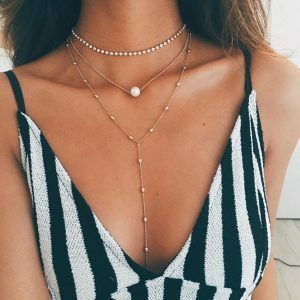 : Wear the choker together with a chain necklace for a layer effect. Do you have questions about the chain choker set with coins? Send us a message! This beautiful colorful double necklace has two different layers. The first layer consists of a chain chain. And on the second layer hang small gold coins, pink, light blue and mint green tassels. 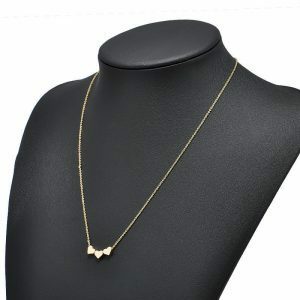 Wear this beautiful necklace with other nice gold jewelry. Example with stylish earrings or with a beautiful bracelet. ???? Add color to your outfit with this beauty! Do you have questions about this double necklace with colorful tassels and coins? Feel free to send us a message. 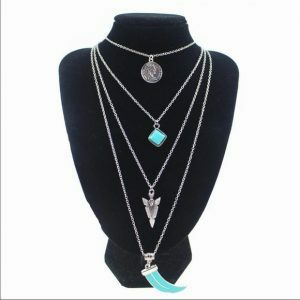 This jewelry set consists of a layered necklace and a layered bracelet. There are two round pendants on the bracelet and necklace. Wear this jewelry set together or separately. Mix and match it with other gold jewelry. For example with beautiful earrings or with a stylish ring. 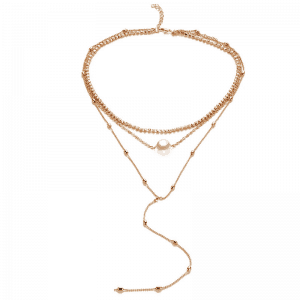 Do you have questions about this jewelry set with layered necklace and bracelet? Send us a message. This layered necklace consists of two different layers. At the first layers there is an elegant pendant. The second layer consists of a chain necklace. 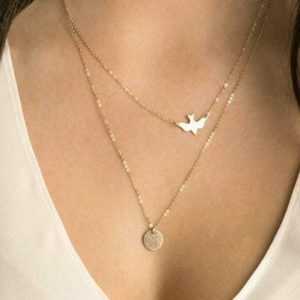 The perfect piece of jewelry for when you do not have a lot of time, to find different necklaces together for a layer effect. Combine this necklace together with other minimalist jewelry. For example, with nice stud earrings or beautiful bracelets. Do you have questions about the layered necklace with elegant pendant? Send us a message. This multi layer necklace consists of four different layers. The first layer has a long gold pendant. The second layer consists of a chain necklace. Beautiful blue beads hang on the third layer. And a small evil eye pendant hangs on the fourth layer. The four chains are connected to each other. You do not have to look for different necklaces for a layer effect. Combine it with other gold jewelry. For example with a nice bracelet or with a stylish ring. Do you have questions about these layered necklace with blue beads and evil eye pendant? Send us a message. This layered necklace consists of 3 different beautiful layers. The first layer consists of a choker necklace with crystal stones. The second layer consists of a minimalist necklace with pearl pendant. And the last layer consists of a Y lariat necklace. Combine this beautiful piece of jewelry with other nice gold jewelry. For example with crystal studs earrings or with a subtle, fine bracelet. Must have accessory that should not be missing in your jewelry collection. Do you have questions about the layers of necklace with pearl and crystals? send us a message. 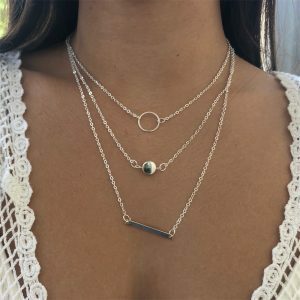 Layered necklaces are super beautiful and practical! This layered necklace consists of two different layers. On the first layer there is an star pendant, and on the second layer there is a moon. You do not have to look for different necklaces for a layer effect. What is practical when you want to save time, but still want to look nice. Wear this jewelry with your favorite outfit. Finish off your look with cute earrings or with a nice bracelet. ???? Our moon and star double necklace is seen in the Girls Magazine! Do you have questions about the double necklace with moon and star ? Send us a message. 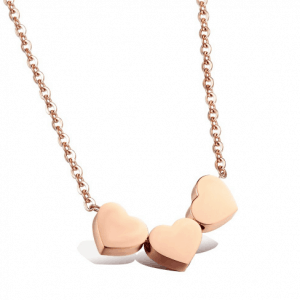 This minimalist necklace has 3 small cute pendants in the shape of a heart. Wear it together with other necklaces for a layer effect. Combine this lovely necklace with other minimalist jewelry. For example with heart stud earrings or a beautiful bracelet with a heart. Complete your look with this lovely ring. Do you have questions about the minimalist necklace with 3 hearts? Feel free to send us a message. Smile is the key that locks everybody’s heart. You will look beautiful with this layered necklace with heart pendant. 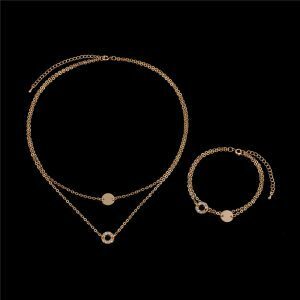 This jewelry set consists of two different necklaces. The first layers consists of a chain choker necklace. On the second layer hangs a cute heart charm. Combine this necklace with ear studs in the shape of a heart. Also a cute bracelet with heart will be nice. You can wear the necklace and choker together or separately. ???? A high wearing comfort due to the light weight. Do you have any questions about the layered necklace with heart? Send us a message. 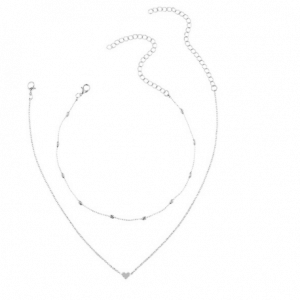 This jewelry set consists of a chain choker and a long necklace with a moon pendant. A must have jewelry that should not be missing in your jewelry collection. You can wear the necklace together or separately. 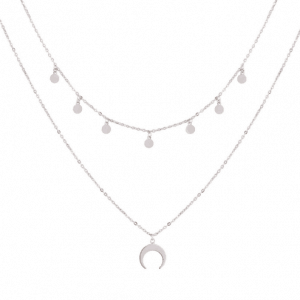 Combine this necklace with subtle moon stud earrings or a bracelet / ring with a moon design. ???? Do you have questions about the Layered necklace with crystal moon set ? Send us a message. 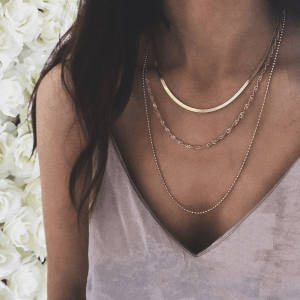 We love layered necklaces, especially when they are subtle! You can combine them with almost all outfits. This beautiful double necklace consists of three layers, with a small diamond piece attached to each layer. Wear it with crystal stud earrings or a nice bracelet. Combine this layered necklace with a black t-shirt or dress for a chic look. Do you have questions about the layered necklace with crystal stones? Feel free to send us a message. We are in love with this beauty! This layer of chain consists of 4 beautiful layers. At the first layer there is a small golden heart. At the two layer there are small blue beads. The third and fourth layer have a stylish coin pendant. The 4 necklaces are chained to each other. You do not have to look for different necklaces for a layer effect. Finish your look with other gold jewelry. For example with a nice bracelet. Or with beautiful studs earrings. 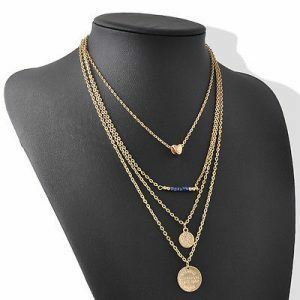 Do you have questions about the multi-layered necklace? Send us a message. 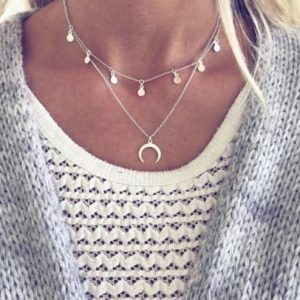 Layered necklaces are super nice and practical! You do not have to look for different chains to create a layered effect. What is useful when you want to save time, and look nice. 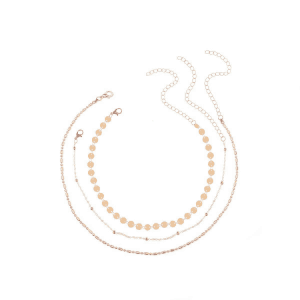 This subtle double chain necklace consists of two different layers. On the second layer there are small stars and moons. 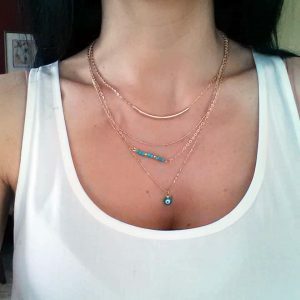 Combine these layered necklace other beautiful jewelry. For example with stud earrings or with a stylish bracelet. 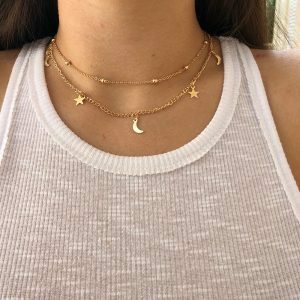 Do you have questions about the layered necklace with stars and moons? Send us a message. Layered necklaces are very popular at the moment! Every fashionista needs a layered necklace. They are not only super fun but also very practical! You do not have to look for different necklaces to create a layered effect. What is practical when you want to save time, but also want to look nice. This layered necklace consists of three different layers. On the first layer hangs a small circle, on the second a small silver circle and on the third layer there is a stick. The beauty of this piece of jewelry is that you can combine it with almost every outfit. Tip: ???? wear this stylish necklace together with other jewelry such as the minimalist round earrings or silver bar ring. 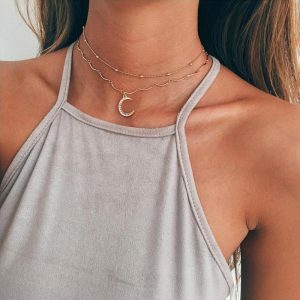 Layered necklaces are super nice and practical! This layered necklace consists of 3 different layers. The first and third layers are full of purple beads and golden leaves. On the second layer there is a gold circle pendant. You do not have to look for different necklaces to create a layer effect. What is useful when you want to save time, and look nice. Combine it together with other gold jewelry. For example with nice studs earrings or with a nice bracelet. ???? 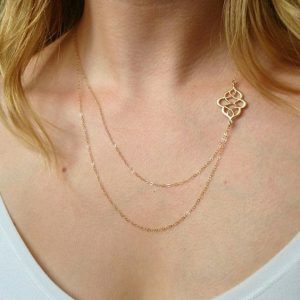 Do you have questions about these golden layered necklace? Send us a message. This layered necklace consists of two different layers. Small silver coins hang on the first layer. And on the second layer a crescent moon pendant. The layering necklace has a subtle design, so you can easily combine with your daily outfit. Finish your look with stud earrings in the shape of a crescent moon or with nice delicate bracelets. ???? Do you have any questions about the layered necklace ? Send us a message. We are obsessed with jewelry! This layer of chain consists of 3 different layers. Combine this beautiful necklace with other gold jewelry. For example, with stylish stud earrings. Or with nice bracelets. The subtle, fine design makes it easy to wear with your daily outfit, to school / work or when you go out for a night out. 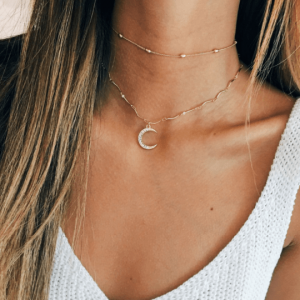 Layered necklaces are super nice and useful. You need different jewelry for every occasion. We have different layered necklace with 2, 3 or more layers. We have beautiful double necklaces with nice pendants. But also subtle, fine minimalist layered necklaces. Very popular is our double necklace with heart and moon. 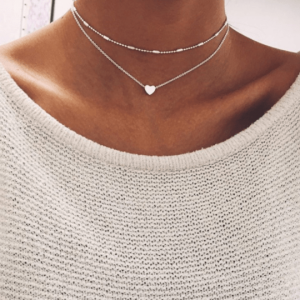 With a nice layered necklace you can easily bring your outfit next level. You can make a choice about statement or minimalist. By wearing simple accessories you can give your outfit a fancy touch. If you want to go through life as a true fashionista, you have to have the right jewelry and accessories. Our multi layer necklaces are available in the colors silver and gold. 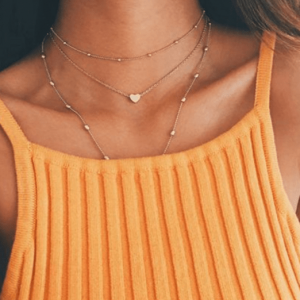 You can spot these necklaces everywhere, on instagram, with the influencers and celebs. And at fashion blogs. With an outfit it’s all about the details. Of course you want your hair to look good, to choose the right bag and shoes. But just as important are the jewelry that you do. Combine your neck candy with our must have armcandy! We have several nice bracelets in our collection. Both minimalist bracelets and statement bracelets. We also have beautiful rings and stylish earrings in our collection. Whether you want to create a girl next door look or a fancy look. At Aphrodite you are at the right address. Combine your new layer necklace with other stylish jewelry. You can’t get enough of the layer trend! Then wear several nice bracelets together for an arm party! For example, the four-leaf clover bracelet would look great with a gold double necklace. You can wear the compass bracelet with the layered necklace with compass pendant. This way you can easily make your own jewelry set. Complete your look with silver or gold earrings. If you do not like eye-catching jewelry, then the minimalist jewelry is perfect for you. Combine your necklace with small, mini earrings. The beautiful earrings with pendants are also very popular at the moment. We have nice earrings in our collection with a small leopard, elephant, airplane, world map, heart, moon, lightning, star and other nice charms. The earrings rings are also very beautiful and you can easily combine them with other jewelery. The v earrings should not be missing in the jewelry collection of the fashionista. You can combine them with the fine arm band with v-shaped pendant. You can also wear your layered necklace in combination with an earparty. Do you find it difficult to mix and match your earrings? then the earrings sets from Aphrodite are perfect for you. Don’t forget to decorate your fingers with the fun rings from Aphrodite. We have beautiful minimalist rings. Also make striking large rings that would fit perfectly with your layered necklace. 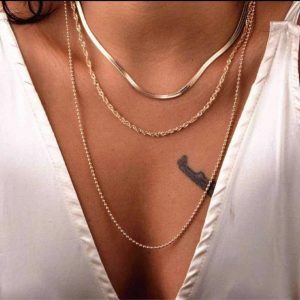 You can also create your own layered necklace by wearing multiple minimalist chains with or without a pendant, or long chains together. We also have other nice jewelry and accessories for ladies. Be sure to take a look at the rest of the webshop.